Exquisite Crystal Long Stem Pink Rose | Feel The Magic Ltd.
View basket “Exquisite Crystal Long Stem Pink Rose” has been added to your basket. Pink is a glorious colour, symbolising grace, elegance, romance and sweetness. Our pink rose makes the perfect favour for weddings, engagements, Sweet 16’s, bridal showers and other Love inspired celebrations. This exquisite crystal glass rose features a long stem rose all made in glass crystal. The rose flower on top is a multi faceted crystal in a glorious pink. Attached to the pink rose bloom is a clear glass stem. On the stem are delicate clear crystal glass leaves that are hand painted with green accents. 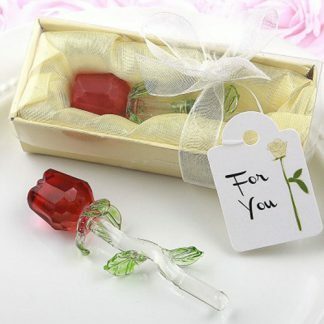 A beautiful favour to offer to your guests at any love themed event. Size 3″ x 1″Crystal long stem pink rose. Made from crystal glass. Rose flower on top is a multi faceted crystal in pink. Attached to the pink rose bloom is a clear glass stem. Stem has delicate clear crystal glass leaves hand painted with green accents. Packaged in a sunshine yellow bottom box with a matching satin inside for the item to rest on. Box has a clear display top. Box is wrapped with a white organza ribbon wrap and bow. Attached to the ribbon is a ‘For You’ tag with a long stem yellow rose design. 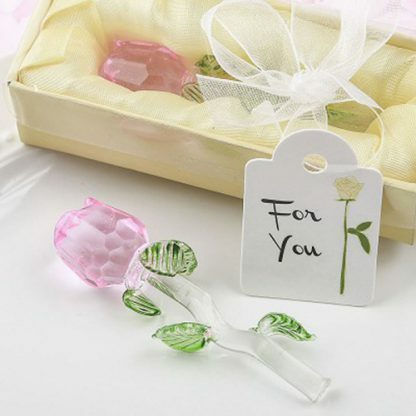 This exquisite favour will delight guests at your special event!